A Climate Caucus Has Turned Into a Magnet for House Republicans. Wait, What? Matt Gaetz, a freshman congressman from Florida, would like to abolish the Environmental Protection Agency. Known for attacking the FBI’s Russia probe and inviting a Holocaust denier to the State of the Union, the House Republican earlier last year introduced a one-sentence bill to terminate the EPA. He’s also heralded Trump’s “strong leadership” for the withdrawal of the US from the Paris climate agreement. So it came as a surprise in November when the House Climate Solutions Caucus welcomed him as a member. It turns out, despite its name, the Climate Solutions Caucus is a hospitable place for many members who, like Gaetz, do not seem especially concerned about global warming. The two-year-old caucus has expanded to 70 members, half of whom are Republican—and many of them have brought controversial records and a questionable commitment to advancing legislation in Congress that would protect the environment. Its critics charge the caucus has expanded its size at the expense of its credibility, providing Republicans who have been actively hostile to government programs a low-stakes opportunity to “greenwash” their climate credentials without backing meaningful action—just in time for midterm elections. In fact, many members may be vulnerable in the 2018 cycle; 24 of the 35 Republican members’ districts will be competitive races, according to an analysis of The Cook Political Report. Republicans in these races could benefit from distancing themselves from Trump’s climate change denial. “They are finding an easy action to get a green badge or a line on their resumes,” says Melinda Pierce, legislative director of the Sierra Club. Before the 2016 election, Citizens’ Climate Lobby, an independent advocacy group, found two Florida congressman—Democrat Ted Deutch and Republican Carlos Curbelo—and persuaded them to form a bipartisan caucus focused on global warming. The group had worked since 2014 to find a willing Republican partner. (The idea grew out of the group’s attempt to form such a caucus among Florida representatives.) Unlike congressional caucuses that draw their members mostly or entirely from one party, Climate Solutions follows a “Noah’s Ark” model in which a Democrat could only join if a Republican does too. As the caucus gained traction, they’ve met a few times, occasionally circulating a letter for lawmakers to sign onto (with limited success), and held their first public meeting in 2017 on the coastal impacts of climate change. A half-dozen Democrats and Republicans were members at the beginning, but it’s expanded faster as the midterm election draws near. Republicans in more moderate districts will have to defend seats where the president has historically low approval ratings. Today, a long list of Democrats are waiting to join the caucus, but all Republicans are welcome. New members aren’t subscribing to any particular set of principles—other than (hopefully) the view that climate change is not a hoax—given the deliberately vague mission of the caucus to educate members of Congress on climate risk and explore policy options around climate change. Meanwhile, Citizens’ Climate Lobby continues to play a role in getting Republicans on-board, by lobbying members and finding supporters for action in their districts. Consider the changes that caucus founder Curbelo has seen since he arrived in the House in 2015. He’s a moderate Republican representing a competitive district in Miami, one of the parts of the country most threatened by sea-level rise (another GOP Miami representative, Ileana Ros-Lehtinen, is a member of the caucus and the GOP mayor of Miami is vocal on climate). Curbelo told Yale Environment 360 in late January that expanding the tent on climate change is significant progress on the issue, compared to when “maybe two or three Republicans” were talking about it in 2015. When Florida’s Matt Gaetz joined the caucus, RL Miller, head of the Climate Hawks Vote super PAC that seeks to elect climate activists to Congress, took notice. “I started taking a very hard look, realizing not only were they not producing anything in the way of a bill beyond press releases,” Miller says. “Their voting patterns were really no different from voting patterns of Republicans outside the caucus.” She has taken to calling Climate Solutions the “Peacock Caucus,” for providing cover to Republicans who face competitive election cycles but don’t intend to do anything on climate. There were other bills the House passed in 2017 that took aim at federal climate initiatives, and caucus members generally voted along party line. One prohibits the government’s use of the social cost of carbon for calculating the benefits of climate regulation, another prevents EPA regulation of methane emissions on public lands, and a third prevents the EPA from using certain air pollution public health data in scientific studies. Some members, including Virginia’s Barbara Comstock, voted for all of them. When it comes to proactive policy with Republican support, the caucus has done virtually nothing. Critics and supporters of the caucus have wondered when they will see a carbon pricing bill—a cost applied to carbon pollution to encourage reducing greenhouse gas emissions—that could draw any Republican cosponsors. During the debate on tax reform, former presidential candidate Mitt Romney tweeted an op-ed by conservative economists that called on Republicans to pass a carbon tax as part of their bill—an option no one took. Two Democrats have introduced their own versions of a price on carbon that have attracted no Republican cosponsors. In November, caucus member Rep. John Larson (D-Conn.) also introduced his own carbon pricing bill backed by 16 other Democrats but no Republican fellow caucus members. Curbelo has expressed support for a revenue-neutral price on carbon, though it’s unclear whether he will introduce a bill. One of the few bills that has garnered any Republican support was one last May that created a bipartisan commission to study possible policies to address climate change—hardly a move towards cutting carbon emissions. “Most people, and probably every scientist, would conclude based on that piece of evidence that he is not a climate change denier,” the spokesperson emailed Mother Jones. In January, the caucus gained arguably its most powerful addition yet, former Energy and Commerce Chair Rep. Fred Upton (R-Mich.). Upton, who has served in Congress for more than three decades, grew more conservative on energy with the Tea Party wave, and once challenged the EPA’s ability to regulate greenhouse gas emissions. More recently, he’s supported drilling in the Arctic and opposed the Clean Power Plan. Even so, he represents a new trend among Republicans that involves moderating their rhetoric on climate change, without coming any closer to actions addressing it as a real problem. Blunt climate denial, like the president’s, has become increasingly unpopular and out of fashion. When asked why he joined the caucus, Rep. Lee Zeldin (R-N.Y.), in an emailed comment, talked about natural resources but not climate change specifically. All Americans, “should have access to clean air and clean water,” he wrote, and he will continue “to protect our natural treasures” through the Climate Solutions Caucus. Freshman Rep. Brian Fitzpatrick (R-Pa.) said in an email via his spokesperson that humans are a contributing factor to climate change. “[L]eaders on both sides of the aisle must take serious and reasonable steps to combat climate change,” he wrote in response to why he joined the caucus. “This isn’t about party. That’s the kind of thinking we need. And it’s that pragmatism that pushed me to join the Climate Solutions Caucus on my first day in office.” Fitzpatrick is one of the Republican members who has been committed to the issue, cosponsoring a nonbinding resolution promoting climate action. Citizens’ Climate Lobby named him the 2017 recipient of its Climate Leadership Award. If members of the caucus were to vote together alongside Democrats in the House, they could certainly block some of the worst deregulatory bills and budget cuts coming out of Congress. But that hasn’t happened. Instead, several caucus members have voted in ways that contradict the caucus’s mission: In December, the Senate version of a federal tax bill included opening up 1.5 million acres of the Arctic National Wildlife Refuge to oil and gas drilling. Eight Republican caucus members signed a letter asking the Senate to protect the wildlife refuge. But when the House voted on the budget bill, all but six of the 31 Republican caucus members, including Curbelo, voted for it anyway. There was one show of strength last year where Republican members played a key role in blocking an amendment that would have removed a requirement for the Department of Defense to study the threats posed by climate change. 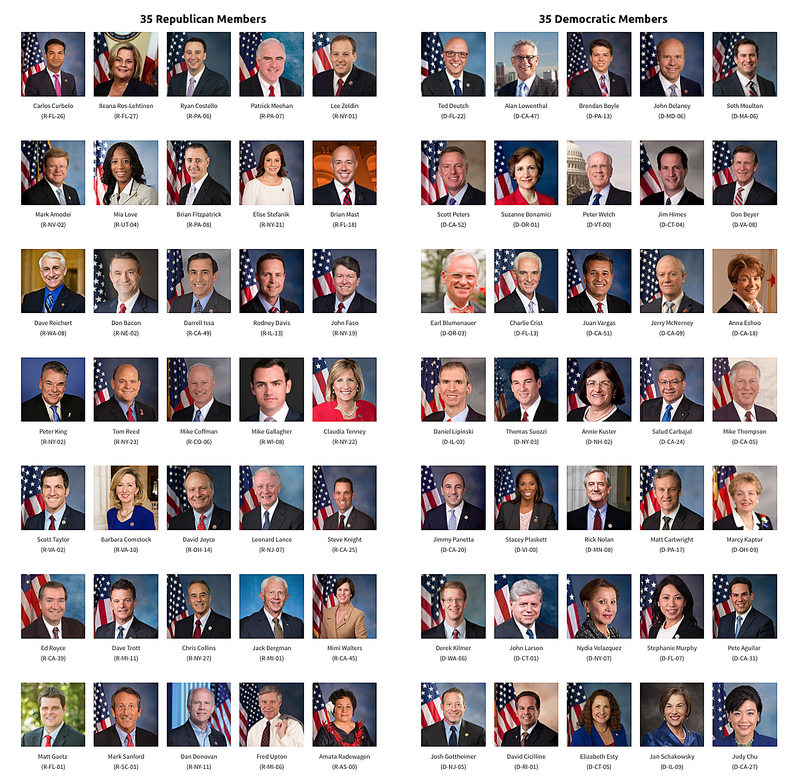 Last July, 46 House Republicans, including all but two of the 24 Republican members of the Climate Solutions Caucus, sided with Democrats to stop the amendment. Sierra Club’s Pierce says the formation of the caucus is a “baby step” toward climate solutions. But she says caucus members haven’t taken enough actions to back up their words. “We just want to encourage them to take off the training wheels and actually ride the bike,” she says. Will Washington State Pass the Nation’s First Carbon Tax?